A luxury recreational vehicle (RV) designed by German industrial designer Luigi Colani made its public debut on Friday in the city of Changzhou in east China's Jiangsu Province. Known for his pioneering designs, Colani gave the 16-meter-long RV a streamlined truck head that pulls a long carriage with indoor space of 40 square meters designed to accommodate 10 people. The living space features central air conditioning, a sofa, digital theater system, massage seats and a modern kitchen. The roof can be transformed into a terrace. "It took a team of 300 technicians five years to make the vehicle. 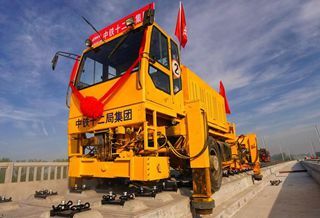 This extremely long, 16-wheel RV requires very advanced automobile manufacturing techniques to make," said Luan Chengmin, deputy director of Colani Design Institute based in Changzhou. He said all auto parts for the RV were purchased in China. The institute plans to add more high-tech features to the RV, including a 5G network for internet service with gigabit speeds. The RV is priced at 18.6 million yuan (2.9 million U.S. dollars). The institute has not made plans for batch production of the RV. Colani is generally respected as a pioneer of nature-inspired biodesign. In addition to cars and ships, he has designed cameras, tea pots, and sunglasses.